NO PURCHASE OR PAYMENT OF ANY KIND IS NECESSARY TO ENTER OR WIN. A PURCHASE WILL NOT INCREASE YOUR CHANCE OF WINNING. GIVEAWAY IS VOID IN WHOLE OR PART WHERE PROHIBITED, TAXED OR RESTRICTED BY LAW. GIVEAWAY IS SUBJECT TO ALL APPLICABLE FEDERAL, STATE AND LOCAL LAWS AND REGULATIONS. PRIOR TO ENTERING Homer Reed Ltd.’S Free Suit GIVEAWAY (the “Giveaway”), AN ENTRANT MUST READ THESE GIVEAWAY OFFICIAL RULES AND TERMS AND CONDITIONS (“OFFICIAL RULES”). ENTRANT MUST AGREE TO ACCEPT AND COMPLY WITH THESE OFFICIAL RULES TO PARTICIPATE IN THE GIVEAWAY. BY ENTERING OR ATTEMPTING TO ENTER THE GIVEAWAY ENTRANT UNCONDITIONALLY ACCEPTS AND AGREES TO BE BOUND BY THESE OFFICIAL RULES AND THE DECISIONS OF THE SPONSOR OR UNIVERSAL PROMOTIONS, INC. (THE “ADMINISTRATOR”), WHICH ARE FINAL AND BINDING IN ALL MATTERS RELATED TO THE GIVEAWAY. AN ENTRANT WAIVES ANY RIGHT TO CLAIM AMBIGUITY IN THIS GIVEAWAY OR THESE OFFICIAL RULES. INTERNET ACCESS IS REQUIRED TO ENTER GIVEAWAY. Eligibility: The Giveaway is open only to legal residents of the fifty (50) United States and the District of Columbia, excluding New York and Florida (the “Eligible Geographic Area”), who are physically located therein, who are at least eighteen (18) years of age or older. This Giveaway and any web sites, web pages and advertisements relating thereto are intended for viewing only within the Eligible Geographic Area. Entries received from individuals residing outside the Eligible Geographic Area, or where restricted or prohibited by law, or from individuals who are not legal residents of an Eligible Geographic Area, or from individuals who are not eligible as described above, will be disqualified. Employees of Homer Reed Ltd., Inc., (the “Sponsor”) and its respective parents, affiliates, subsidiaries, distributors, sales representatives, Administrator and all other service agencies involved with the Giveaway are not eligible to participate or win. Sponsor and Administrator: The Sponsor is Homer Reed Ltd., Inc., 1717 Tremont Pl., Denver, CO 80202. The Administrator is Homer Reed Ltd., Inc., 1717 Tremont Pl., Denver, CO 80202. The Administrator is not an independent judging organization. Decisions as to the administration and operation of the Giveaway are final and binding in all matters related to the Giveaway. Timing: The Giveaway begins on 4/1/19 on or about 12:01 a.m., MDT and ends on 10/01/19 at 11:59:59 p.m. MDT (the “Giveaway Period”). The Sponsor’s computer clock is the official time-keeping device in this Giveaway for the Homer Reed Ltd. Application Entry Method and Administrator’s clock is the official time-keeping device in this Giveaway for the Website Entry Method. 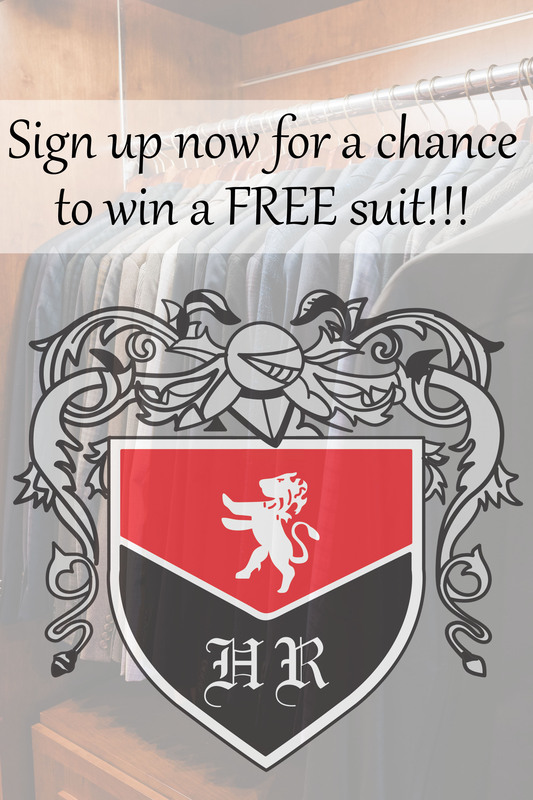 How to Enter Giveaway: There is one entry method through HomerReedltd.com/Free-Suit. Entry Screening, Entrant Verification and Restrictions: Sponsor and Administrator reserve the right to screen Homer Reed Ltd. Entry Method and Website Entry Method entries, hereinafter referred to as “Entry” or ”Entries,” and in their sole discretion Sponsor and Administrator reserve the right to disqualify and remove any Entry that fails to adhere to these Official Rules. Neither Sponsor nor Administrator are obligated to notify Entrants of their actions to remove or disqualify any Entry. Entrants agree if his or her Entry is contested in any manner for any reason whatsoever, Sponsor or Administrator may disqualify that Entry and discontinue use without notification and Entrants agree if any Entry is contested in any manner for any reason whatsoever, Entrants will not contest the decision of Sponsor or Administrator and that such decision shall be final. Entrants are not permitted to use another person’s identity, Homer Reed Ltd. account, or email address, nor can an Entrant share the same Homer Reed Ltd. account or email address to enter the Giveaway. If a person is found using another person’s identity, email address or Homer Reed Ltd. account he or she will be disqualified and ineligible to claim any prize. In case of a dispute as to the identity of an Entrant who uses the Homer Reed Ltd. Entry Method, Entry will be considered to have been made by the authorized account holder of the Homer Reed Ltd. account, identified with the Entry submission, regardless of the person that submitted the Entry. In the event of a dispute regarding Entries received from multiple Entrants using or having the same Homer Reed Ltd. account, the authorized account holder of the email address associated with the Homer Reed Ltd. account at the time of Entry submission will be deemed to be the Entrant. Sponsor reserves the right to deem that the Entry was submitted by the authorized account holder of the email address associated with the Homer Reed Ltd. account. “Authorized Account Holder” is defined as the natural person who is assigned to an email address by an Internet access provider, online service provider, or any organization that is responsible for assigning email addresses or the domain associated with the submitted email address. In the event an Entrant wins a prize, and is later found to be in violation of these Official Rules, Entrant will be required to forfeit the prize or, if the violation is discovered after the prize winner has used or redeemed his or her prize, to reimburse Sponsor for the stated approximate retail value (the “ARV”) of the prize listed in these Official Rules. Non Capture of Entry and Entry Errors: In the event that for any reason whatsoever an Entrant’s Entry, or any portion thereof, is not captured as a full submission in accordance with these Official Rules, whether through no fault of Entrant or otherwise, including but not limited to as a result of the effects of hackers or the failure of any electronic equipment, or human intervention, computer or cellular transmission, or network connections, any such attempted Entry submissions will become null and void and Sponsor shall have no duty to advise Entrant, to allow Entrant to resubmit, or any liability for such failure in any respect; all of which Entrant hereby waives to the fullest extent permitted by applicable law. Specifically without limiting the generality of the foregoing, Sponsor is not responsible for any lost, late, illegal, intercepted, incomplete, misdirected, damaged, destroyed, mutilated, or not received Entries, or for errors, omissions, interruptions, deletions, defects, delays in operations, in transmissions of Entries, nor is Sponsor or Administrator responsible for any individual who fails to successfully enter Giveaway. Proof of sending an Entry will not be deemed to be proof of an Entry submission, nor will it be deemed proof of receipt by Sponsor or Administrator.